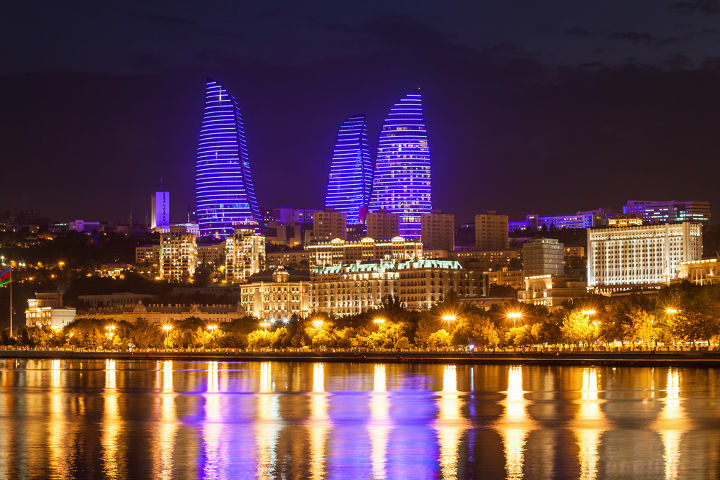 Azerbaijan is explained in details in this travel guide for the curious travelers. Read more to learn more about the attraction points in the country. Having an important source of income, which is oil, Azerbaijan has developed so rapidly especially in the last decades and become a more interesting country among the international investors. When you wander around the country, the beautiful nature and the rich history will meet you anywhere. The stunning Great Caucasus or the world's largest inland body of water, Casbian Sea will inspire you as well as the picturesque rural villages and the historical landmarks such as the palaces or the mosques. The cuisine of Azerbaijan will also make you come back again to this beautiful country. You will have the chance to try many different variations of one dish and each of them, for sure, will taste better than the other one. The multiculturalism and the deep history of Azerbaijan contributed so much to the richness of this cuisine. Azerbaijan is located in Transcaucasia and surrounded by Caspian Sea on the east, Russia on the north, Armenia on the west and Iran on the south. Azerbaijan requires visa from some of the countries. Before you travel to Azerbaijan, it will be wise to check if your country is obliged to Azerbaijani visa via the official website of Republic of Azerbaijan Ministry of Foreign Affairs. Sheki is a picturesque town located in on the southern part of the Greater Caucasus. It is nearly 300 km away from Baku and has so many things to see. The city has a deep history dating back to 2700 years before and it was a market center on the Silk Road. If you visit Sheki, make sure you visit Khan’s Palace that is ornamented with hand paintings and has a spectacular garden. Palace of Shaki Khans can be your other destination in the town. Built in 18th century, it was used as the summer residence of Shaki Khans and it is mostly interesting with its frescoes on the interior walls. Khacmaz will definitely captive you with its natural beauties. 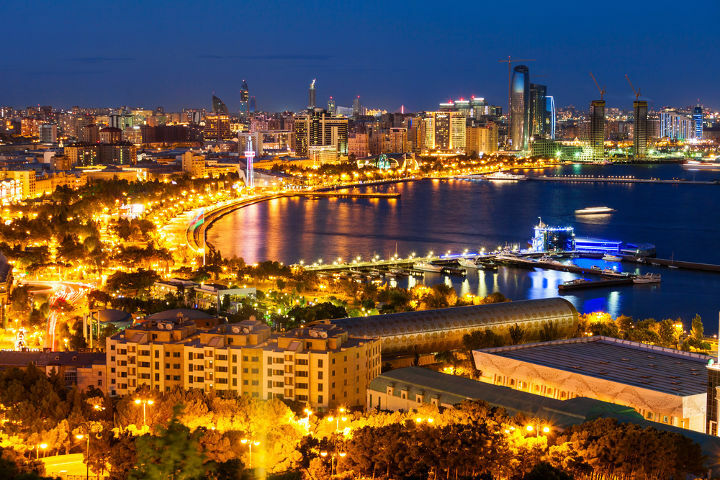 It is located nearly 150 km away from the capital city, Baku and it is famous for its beaches and the forests. However it has many historical places that will appeal to you. 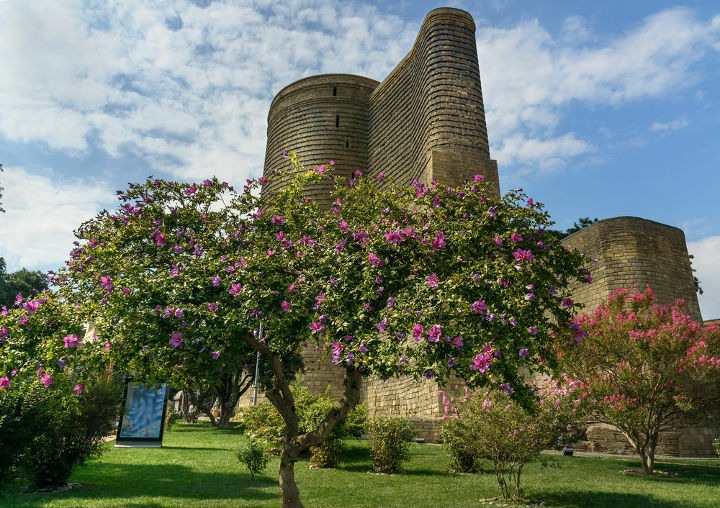 The must see places in Khachmaz are Sarkartapa archaeological site, Khudat Castle, 4th-century Albanian mosque and the 16th-century mosque-madrasa of Shah Abbas. A UNESCO World Heritage Site, Gobustan National Park is located on the southeast end of the Greater Caucasus. The deep ravines, ancient carvings gas stones and the famous mud volcanoes make this area unique and the mountains in the area are under the protection. Gobustan National Park will undoubtedly be the most interesting part of your Azerbaijan visit. Naftalan is a city in Azerbaijan that is located 320 kilometers away from Baku. What makes this city special is the crude oil that is found in abundance. This oil is known to help heal urologic diseases, skin diseases, coronary diseases, bone diseases and more. So many hotels in this city offer crude oil spas and draw many national and international tourists to the area. So if you also suffer from similar diseases, you’ve come to the right place! Located 3 hours away from Baku, the capital city of Azerbaijan, Quba is a small city that is known to house the largest population of Jews in the former Soviet Union. This city has many remarkable landmarks to see such as Sakina-Khanum Mosque and Chuhur Hamam. If you have some extra time during your Azerbaijan trip, visiting Quba will be a good experience. The currency in Azerbaijan is New Azerbaijani Manat and the prices are low when compared to most European countries. For shopping, you will have many options in this country. Shopping malls, flea markets or street vendors are the places where you should pay a visit for unique, traditional items or for your other needs. 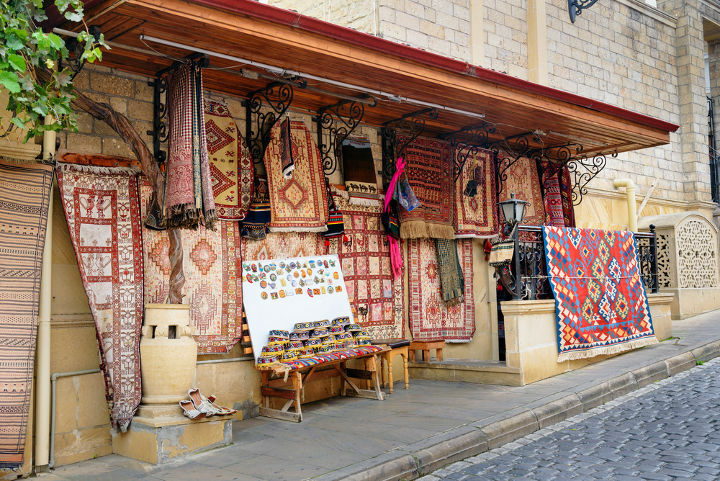 Carpets of Azerbaijan are in UNESCO’s Representative List of the Intangible Cultural Heritage. Every region has its own patterns on the carpets and each carpet has its own story. Oil is the primary income for Azerbaijan so crude oil can be found in anywhere and in any form in the country. For the best examples of Crude Oil Paintings, you can look for Piers Secunda’s and Sabir Chopuroghlu’s works. Traditional and mostly hand-made potteries are another great souvenir options. It will be hard to choose from those colorful bowls, plates or cups! Buta is a traditional Azerbaijani ornament that symbolizes fire and you can see it on clothing, scarves, purses, bags or even more. What makes Azerbaijani Cuisine unique is the natural ingredients and the diversity. Also in Azerbaijani Cuisine many different cooking techniques are employed and this adds up to the richness of the cuisine. Meat and vegetable dishes are dominant. However, olive oil dishes are rare. Pilaf (plov in Azerbaijani language) can be considered as the king of all dishes in Azerbaijani Cuisine. There are more than 40 variations of this dish and it is almost served for each meal. Kebab is a very common dish in that area but Azerbaijan has one of the best recipes of Tika Kebap and Lyulya Kebab. Known as the traditional soup of Azerbaijan, Piti Soup is made of mutton and vegetables. One of the most popular dessert in this cuisine, together with baklava, is Shekerbura. 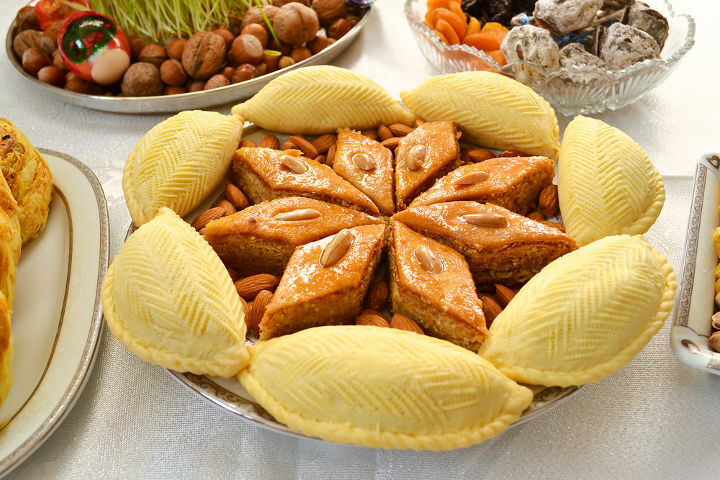 It is stuffed with hazelnuts, walnuts or almonds and mainly served at festival meals.